On the surface, this was a fairly normal weekend: ran 12-miles in the rain, which was actually fine, even good; got some new bike handlebars with my REI dividend; watched The Help while it rained, rained, rained; went on a bike ride with said new bars once the sun came out; ate a bunch of coconut meat. But there was one thing that made this weekend extra-special. I am beyond thrilled to share that one of my favorite bloggers, Jasmine at Paintbox Kitchen, has tagged me with two awards: The Versatile Blogger and the Very Inspiring Blogger Awards! The warm fuzzies and gooey innards hardly touch what this means to me. Thank you, Jasmine!! The premise is simple: Jasmine herself was nominated by a blog friend of hers, who was previously nominated by a blog friend, who was previously nominated by a blog friend, and so on, backwards through time. The winner shares 7 things we might not have known about them, then they link to a) the person who nominated them, and b) the new winners of the award. I guess the original rules say you’re supposed to link to 15 people, but Jasmine linked to 4, and I am still quite green so will link to 5. In good punk rock fashion, we’re making up our own rules. DIY, baby! So, the deeper, and extra-cool part of this award system is how connected it makes us. I read the blogs I do because I like the personality of the blog writer, trust their opinion (even if I don’t always agree with it), and simply think what they have to say is valuable. Then it goes without saying that I would probably like the other blogs that Jasmine nominated and I would probably like the blogger who nominated her, and so on and so forth, backwards through time. It’s a web, see, that spreads across the world! A world-wide web! THAT IS SO COOL. 1. I’ve been to Burning Man nine times. And while I no longer go every year, I still hold dear to my heart the 10 Principles and include them in my everyday life, particularly Radical Self-Expression, Radical Self-Reliance, Participation (No Spectators), and Leave No Trace. 2. One day a week, usually Sunday, I spend 2-3 hours prepping food for the week. This makes it easy to grab healthy, well-rounded, veggie-tastic, protein-filled meals and snacks whether we are working from home or on the go. Prep includes things like roasting chicken and turkey breasts, hard-boiling eggs, pre-making lunch salads and wraps, making a big batch of protein pancakes, dehydrating veggies and/or crackers and flatbread, soaking beans and nuts for sprouting, soups, and snacks. 4. I discovered my love of open-water swimming while training for my first triathlon and hope someday to do an Alcatraz swim. That’s when you take a ferry across the San Francisco Bay and jump into the water when you reach the famous island ex-prison, then swim across the bay until you reach land. Like an escapee, get it? The SF Bay is about 55 degrees year-round, but with a wetsuit, it’s totally fine. I haven’t yet reached no-wetsuit bravery, but people do it all the time. I think the Alcatraz swim is 1.5 miles. 6. My birthday is next Saturday ~ March 31! That makes me an Aries, but I have a Cancer moon and Cancer rising, so I’m like a ball of fire surrounded by water. Like some beautiful Polynesian-esque display where there’s a giant, roaring fire pit set up in the middle of a pool. Or something like that. 7. An astrologer once described me as, “the exact middle point between introverted and extroverted.” I couldn’t have said it better myself. 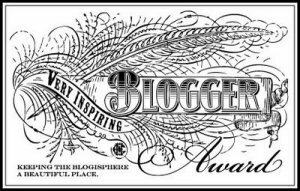 And now… I’m very happy to announce the newest winners of the Very Inspiring Blogger and Versatile Blogger Awards! The rules are simple ~ when you’re tagged, link back to this site, share 7 things about yourself that we might not know, and then pass the award on! Of course, you’re welcome to ignore all of this, too. And that is totally fine. But I think you’re cool, so that’s all that matters! Diva Sarah is a California girl turned Aussie whose interest in heath, food, and fitness never fails to inspire me. Her blog’s tagline, “Balancing Fitness, Food, and Feeling Good!” sums it up with a big, motivated smile! In just a month, Erika has jumped right in and shared her friendliness, adorable family, and motivation to run a half-marathon! Her smile and sense of humor are infectious. I just can’t wait to hear how the Hot Chocolate run went! Megan also lives in Australia! She’s super-motivated, inspiring, and like a burst of sunshine and fresh energy. Smiles all around, Megan! You can’t argue with a title like that! 🙂 Rebecca posts super-interesting information about various natural items and their benefits, plus not-so-great items and why to avoid them. She covers everything from BPA to tea tree oil to garlic and it’s always presented clearly, with references and source info, so you gotta trust her! Well, I hope you’ve all enjoyed this round of Blog Awards. May the web continue to be woven and the connections continue to grow! Haha! I know the timing was a little coincidental 🙂 You could always just link to your A to Z! Ha, how funny, I spent the whole weekend reading The Help! I was sooo tempted to go and rent the DVD halfway through but held out. I stayed awake till about 1am on Saturday night trying to finish it (looooser!). It was totally worth it to read the book first!! And you are NOT a loser, haha! The movie was really good but the book was so much more in-depth. Have a great one! Hey girl! I just tried to post and it didn’t let me 😦 I will try again! Thanks so much for nominating me and also for the extremely kind words! You rock! I will totally keep the chain and love going! It might take me some time to write up the post and to write 7 interesting things about myself. How long do I have to do this? Also, should I copy the blogger awards to my post? Sorry for so many questions, but I am new to all of this! Have a rocking week and look for me Wednesday in the Marin IJ. My blog will be featured. You can view it on-line without a subscription. BTWs, so proud of you running 12 miles and in the rain. WOW! Hi, Jackie! That’s so cool your blog is being featured!! I will **definitely** check it out. You deserve it!